Quite often we hear the question asked, what is life? What is the meaning of it all? What’s the purpose? What are we here for? There’s an easy answer, which is almost a cliché, spiritual growth. You’re here to grow, and grow, and grow. What does that mean? Does it mean going to church? Praying in concert, in communion? Learning the Bible? Piety? These are all very important parts of developing ourselves spiritually, but basically, we’re thinking creatures. We don’t really complete the job of spiritualizing ourself until we begin to refine our attitudes. It’s so easy to take on one attitude, which is a sort of, worshipful, prayerful attitude when we’re in church or doing religious things. It’s another thing to consider the attitudes that we hold precedence in our office or our shop while doing our work. At the workplace is probably one of the best places to begin to stimulate spiritual growth. It’s the last place that most folks think about. We say often that life is consciousness. This means all your thoughts, your feelings, your attitudes, things that make up your state of mind at any period of time. Nothing ever just happens. I was going along very good until this thing happened. Out of the blue, I was back on my back, facing difficulties. Nothing ever just happened. We say, “Oh, things were going real good. They were really going great. Then, all of sudden, something unexpected happened.” Something unexpected always happens at that time. We understand consciousness. We know that the unexpected something is a trap that we’ve previously set for ourselves. It’s our consciousness, it’s our life. We’re involved in everything that happens. Nothing is unrelated to consciousness. A person runs to work. Wants to share his thoughts and feelings with co-workers before work in the morning or around the water cooler during the daytime or the lunch hour. He wanted to talk about the thing a person work for, the employers, the coworkers. “It’s just the way things are around here,” we say. This company, my employers interested in one thing, the bottom line. They couldn’t care less about me or the workers. These are attitudes. We hear them. We perhaps, participate in them sometimes unthinkingly. Not realizing that they’re a part of the general consciousness that’s gonna have effect upon our whole life, especially our prosperity. When we seek attitudes like this, we’re working against ourselves. Why go to work at all if you’re gonna work against yourself? Why try to make progress or to succeed if you’re gonna work toward difficulties, limitations? A man was once talking with a family friend, telling him he was moving, “I’m gonna help you move. ‘I don’t need any help we have some various moving people,’ but I wanna help. What’s a friend for if you can’t help?” On the day of the move, the moving van showed up, and the men in white coats were going in and out of the house carrying things. This man came along, and feeling the responsibility and the of joy and friendship he took off his coat, rolled up his sleeves and went to work carrying boxes in and out. 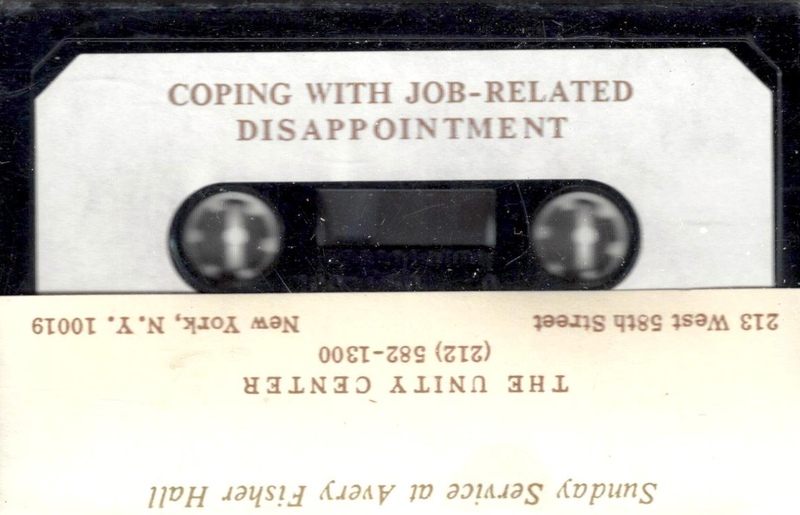 Today we’re gonna talk about coping with job-related disappointment. How to cope. The dictionary defines cope as, “To contend with on fairly even terms with a degree of success.” I good truth student keeps the word cope as a very important attitude in his consciousness. Learning to deal with situations or the challenges with a degree of success. So often, we get so involved in things that we’re doing and goals that we’re working toward, we act for all the world as if everything begins and ends with this job or getting that promotion or catching that bus. Keeping us under a constant state of pressure, fighting time, resisting change, dealing with people who are working under a different set of priorities. A person that has goals are a rarity. Do you have a goal for yourself? Do you have a goal in your work? Something that you’re working toward? I’m not saying that we should follow the suggestion that is often made to sit down every day and set a series of goals for yourself and work towards them constantly. That can be carried a little too far. It’s important to look at ourselves and say, “What do I want out of life? What’s life all about as far as I’m concerned?” People with goals are a rarity. They say that 9 out of 10 people have no plan for their life. They just drift aimlessly along. Go to work, do the work that’s called on them to do. They may do it as best they can and go home at night and watch television and just react to things that happen. I think of the story of Alice in Wonderland. Alice asked The Mad Hatter for directions. He said, “Where do you wanna go?” She said, “I don’t know.” He said, “Then, any direction will do.” Great logic in the wit of Lewis Carroll. If you own your own life you realize it happened because of something in my consciousness. What did I do? You were there. I mean, that’s all that happens. Great chaos around you. What’d I do about it? You know that you were involved in it because you were there, physically, emotionally, mentally. So, you were a apart of it. Don’t ever blame it on others. Certainly, things happen often. Don’t hide your head in the sand. The experience is there, the incident is external, but the reaction to it is your own. Incidents out here, it’s people, it’s conditions, it’s the way things are, but my reaction to it is my involvement in it, and we always have a reaction. We often have a reaction that we justify, a negative reaction, “It’s not my fault, it’s them. How can I help it when things are like they are?” Problems on the outside can be handled, but when it gets under your skin, it becomes your problem. Your hurt, your despair, your anger is not caused by people or by the policies of the company you work for, but by your negative reactions to them. You can’t do much about what the boss says or does. You can’t do much about your co-workers. 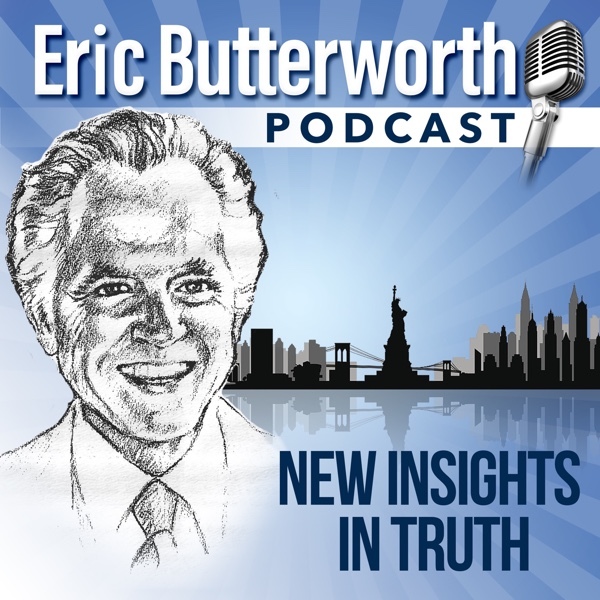 You can’t do much about the financial conditions that influence what goes on in your place of business, but your negative reactions are yours, and you can control them. You can. One of the most important steps in truth is to realize that I can control my reactions. I don’t have to be angry. I don’t have to be upset. I don’t have to be fearful. I don’t have to be apprehensive about the things that they say are going on in the economy. I can keep my own perfect peace, set my own goals. Franz Kafka, the Austrian poet/philosopher says, “People wake up one morning to find that they’ve turned into bugs.” He was wrong. People wake up, go to work, discover that something is bugging them. The most important thing is to meet it, to deal with it. To accept it as something that’s going on in your consciousness. The word disappointment is an interesting word. To me, it seems to suggest an appointment with a divine flow that has been missed. A missed appointment. I’m just taking a little etymological liberty with the word, but that’s my forte, taking etymological liberty of words. It doesn’t mean that at all, too. The most important thing in life is to know that you are constantly dealing with life in terms of a divine appointment. Things happen. You see in the appointment things happen for good. It’s a divine appointment. A divine possibility unfolding. So, when you have a disappointment, it could be said it’s a missed appointment. You’ve missed the divine process. You got out of the flow. Let’s be honest, everybody has setbacks. The job didn’t work out. A trusted associate that let you down. You’re disappointed with yourself for not reaching goals that you’ve set for yourself. It’s a broad subject this matter of disappointment, but we’re gonna confine our discussion to these three areas: job, which may include your boss, your company, your corporation, the policies; your loved ones, including your friends or associates on the job; disappointments with yourself. Normally, when we start out on a job we’re very excited, we have great expectations, because within this job I have the opportunity to advance, to prosper, to achieve the good life. We all entertain those hopes, if we don’t, we’re not really alive. You see injustices in your office and your workplace. You see favoritism, and that begins to impact your office politics, arbitrary layoffs. All this chance to create, and if you’re not careful with your attitudes, a sense of disappointment. Disappointment in your job, your company, your co-workers. This leads you with insecurity and distrust of the corporation. Anxiety that someone will get credit for your achievements. And the worry that someone or something can conspire to keep your good from you. Such as this thing they talk about inflation and recession. Many folks feel that the recession will creep up on them and have an influence on their life in a negative sense. Many of them talk about the fact that’s it probably inevitable that some of us will be laid off. So we should hold our money, we shouldn’t spend very much, put our money in the mattress, sit tight and see what happens. But you’re not gonna have to wait long because recession is gonna happen. We’ve caused it by our attitudes. It’s probably true that the major cause of recession in our country, if there is such a thing, is the thoughts of people. If the recession could be solved overnight, everyone would say, “It’s not a time for reaction, it’s time for action. It’s not time for saving, it’s a time for spending.” Stimulating the economy, we all have a part in it. Between now and Monday morning and Monday night after the sales of the day, if we all got involved in this attitude of giving, serving, expressing, buying, experiencing, activity, dynamic thoughts, by Tuesday morning you’d hear in the paper that the economy had changed. And you make the difference. And I think every person needs to discover that his work is his appointment. It’s your calling. It’s an old-fashioned idea, your calling. It’s a very important realization. Too many of us think of work as a place to earn money. A place to get on the payroll somewhere. So, to do this, we do have to cultivate the idea of service, involvement, commitment, giving, serving, to think of your work as a divine appointment. And by the way, the creative flow, you realize that the divine activity is seeking to do a special work through you. Which made me think of Browning, “God cannot create Antonio’s Stradivarius without Antonio.” God cannot create the things that are there for you to do without you to do them. That’s why you’re there. That’s why the job is there. That’s why the company is there. That’s why you have the conditions in there, for you to be a part in it, to stimulate. So think of your work as a divine appointment and keep the appointment. And working with a positive attitude is something for you to do. If this is a divine appointment, the appointment has to be kept. If you don’t wanna keep the appointment, get out of the flow. It would be a missed appointment or disappointment. It’s almost inevitable. One woman is a student of truth. Tells a sad story of herself. She was laid off at her job, the company, after 25 years. Here’s a sad story, not because of the loss of her job. The loss of the job doesn’t have to be sad. Matter of fact, I’ve been saying of marriage, “If it can break up it should break up.” It may be a startling point to you but the point is the thing involved in the marriage that has you on the brink of dissolution and break up, if you get that far. And the problem is that in your consciousness and in the eyes of those involved, there’s the makings for a dissolution, the marriage should break up. You can lose your job with a company. If you can be laid off you should be laid off. I didn’t mean that you’re the blame to it. Your conscience is involved, sure, but I’m saying that you think of life as a constant process of drawing to yourself your goods, your divine appointments. To come to the experience where there’s even entertaining the thoughts of laying off a person that includes you, the divine appointment is faded away, there’s only a missed appointment, maybe a disappointment. I’m gonna be a starring thought for some of you. It’s important to see. Anyway, this woman is very bitter because she lost her job after 25 years with the company. She began to proclaim to everybody who would listen to her, “This company tossed me out, relegating me to seven years of living hell.” It was her indictment against the company. “A period of a living hell.” Seven years referred to the time she, “Nursed her wrath to keep it warm,” as one poet says. But the employer was not responsible for the living hell, that was caused by her own reaction. She may go through the rest of her life resisting, resenting, hating this company, even the thought of his name, “Because of what they did to me.” I talked to a man some years ago when he was still entertaining the feelings of the depression, being cast out of the marvelous job, with all the perks and beautiful home, and lovely cars. He was tossed out. And then, after going without for a few months, he was actually destitute. His family grew up during the depression years and they were sort of carrying on the tradition of the anger and the hostility toward this company and toward all big companies. This man never recovered. And he passed on that attitude, that resistance, that resentment and insecurity to the next generation and probably the next. And it probably went on generation after generation with this negative attitude. This woman, fortunately, came to herself. She had known about truth and she realized that if there’s a living hell, it was caused by her own reaction. She opened herself to the possibility of a new vista, so she realized, as I said, that if they could dismiss her and didn’t appreciate her, it wasn’t a divine appointment. As the Bible says, “Except the Lord buildeth a house they live there in vain that built it.” So she saw that that change needed to be made. Which opened up a, humanity is real, but God meant it for good perspective. She moved on joyously to a divine appointment that came in a new field, a new position. She looks back with gratitude on what’s happened. All things work together for good to them that keep themselves in the flow. Many persons are facing unemployment today due to the economy. It’s sad. Well, the sad part is the negative reactions of the people who face the experience, often with confusion, and bitterness, fear, self-pity and insecurity. The trouble is, I wanna be understanding about this because this is not an easy thing to face. The trouble is, we tend to think of the experience as a permanent condition. Unemployment is a terrible word. Unemployment, “I’m now among the unemployed.” Put a sign on your chest, “I am unemployed. That’s what I am.” And that’s what you’ll always be as long as you hold that attitude. I have a statement that comes from the Bible that I love, “It has come to pass.” Here, the implication is it happened, it’s in the past. It’s a dynamic idea. It’s come to pass, to pass on, not to stay. We think of negative experiences as something that’s come to stay, a valued relationship, a difficult job, being fired from the job, having financial challenges that are seemingly above your ability. It’s all conditions that’s come to pass. Get that in your conscience, it’s come to pass, not to stay. So unemployment is a moving experience between jobs. A moving experience between jobs. So, all that remains when one has let go of a job, all that remains is the movement that takes you to the next job. Consciousness has got everything to do with it. If you let the idea of the static condition enter into your consciousness and you’ll have a deuce of a time in the period, you’ll have the living hell and you’ll be looking for people to blame. But if you understand that it’s a movement between jobs, it’s not so fearsome of a thought at all, is it? It’s important for every person involved in the study of mind and realizing the importance of attitudes to stand against the juggernaut of hopelessness and futility that’s sweeping the country. You read the headlines in any paper today, somewhere on the first page will be something relative to the terrible economy. And all the prognosticators are telling you the things that are gonna happen, “People are gonna be laid off. Your business is gonna have a bad Christmas this year. People not spending their money. Hard times everywhere,” and all the things that they usually talk about. There should be a law against this. I know that applause indicates that your ready for this concept. So, we’re gonna work on it. Be enough to see possibilities within the attitudes of, if the the people who woke here this morning, we could change the city by tomorrow morning. Another source of disappointment on the job is people. People are the greatest difficulty for most of us. Where a job normally means working with someone, co-workers, covering employees, almost always, we’re co-dependent. Dependent on one another. Depending on the attitudes of another, and depending on the graciousness of another, the love of another, the generosity of another, and even somewhat sadly, by the negatives of another. We’re not gonna be, and naively assume, that we’re all one team. We’re all working together for one goal. This is a great ideal to hold, and certainly we wanna hold it as a discretion of awareness. But in a practical sense, it’s important that we ... I mean, other people are human. We’re gonna be looking for the next promotion in the office, half a dozen other people are, too. In a sense, we create a competitiveness between workers. How many ... I forget the name, but this one writer talks about, “Father forgive me for expecting in the human that which is found only in the divine,” It’s Imelda Shanklin. “Father forgive me for expecting in the human that which is found only in the divine.” Forgive me for expecting people to be perfect. To have loving thoughts, to be as interested in my good as they are on their own. A nice idea. People are human. In a sense, it’s important to collaborate with people, to be cooperative with them, to work with them, but we should never put one’s whole trust in people, only in God. I mean, you can delegate authority but you can’t delegate responsibility, it’s said. You still have the strings of responsibility on yourself. It’s hard to remember the Namaskar approach, Asian concept which means, “The divinity within me salutes the divinity within you.” It should always be the guide in the direction for us in our relationship with people. We look beyond the human to see the divine. We bless that in the person. We don’t let that be a means of getting out from under responsibility. I’m not gonna pretend to think, “If I love a person, I praise the good in him, he’ll look after my responsibilities,” so, I turn it all over to him and I’m hurt if he lets me down. I forget that he’s got his own interests to look into too. Your divine appointment is with God, not with people. Your divine appointment, keep in-tuned with the divine flow. Keep divine love and the creative activity, especially through which you do. Don’t let go of that. One man worked besides another in an office, they were co-workers. They were friends. They’d both worked with the company for many years. They had a friendly competition to see who could achieve the most. And both of them had become the best workers in that office. It was always assumed that if there was an opening, at least one of them would advance. They heard the rumors that the boss was gonna be transferred to someone in another department. They’re all thinking about who is gonna be selected as the next boss? Obviously, this created a pressure on the friendship between these two. They had a competitive spirit going with them and obviously, it’s a fact that one of them, not both of them, are gonna be promoted. It was a great tension that went on for a couple of weeks while the rumors flew on. Finally, the rumor also came to this man that his friend had misrepresented something to the boss. As a result, the man received the promotion. The man was disappointed, disappointed with a friend, faced with a company who allowed this thing, but he also was one who was quite aware of the importance of his own attitudes. He knew that he could destroy himself by engaging if he wanted to. But he chose to deal with the experience creatively. So, he had to test it with himself as you can imagine. He realized that he had to forgive this friend, this co-worker. He found it hard at first, but he finally decided it was the practical thing to do, because if he carried unforgiveness, then as Emmit Fox says it’s like a chain that you attach to your wrist, you become a slave. So, he forgave the man. He realized that it was a competitive thing and who knows, a man like him being overly competitive was not even aware of the immorality of the thing that he did. The man said to himself, “Perhaps, therefore by the grace of God, go I.” So, he made peace with this. He let it go. A couple weeks later, the big boss called him into his office. Told him they appreciated the work he had been doing for the company. Another opening in another department, they were gonna put him in charge of. It was a space between two jobs, two activities, which has worked out harmoniously by his positive thoughts. There’s always a disappointment on the job. There’s also the disappointment with yourself. Maybe you failed to reach your goals that you had set for yourself. Right off, I became to think of myself as a failure, basically because you haven’t begun to see situations that we haven’t had as much as we thought we’d like to, we haven’t gone as far as we think we should, have a sense of disappointment with ourselves. It’s important to realize that anything you do is gonna succeed. Give yourself the opportunity to fail. That sounds negative, doesn’t it? Give yourself the freedom to admit that you haven’t gone as far as you’d like to go. If you’ve gone as far as you need to go at that time, do your best and leave the rest. Accept the best, accept the fact that you’re accomplished in some things. Give yourself an occasional pat on the back. Give yourself an occasional blessing. Be grateful that you’ve done as much as you can do. I’ve gone into offices and shops where there’s a sense that employees are physically present, completing the tasks that are required of them, but have a sense that nobody’s really there at all. Nobody’s really there. They’ve been giving only a small part of themselves. They have their work on automatic pilot. Most of their energy is in reserve. You don’t like to face up to that, but realize if you look at the marketplace, this is often the case. The survey released recently, the confidential survey of workers were promised that their part in this would not be released to anyone. It showed that one out of four worked up to their capacity. Half of the workers said they did not put forth any effort in their jobs beyond the minimum required. Why should I? I do what I’m paid for and do all that I’m asked to do. Do you ask enough of yourself? Eventually, he came to the fact that they could have held him with a piece of string. Other guys see it there and he knows how it goes so he just stands still. You see elephants in a circus today, you’ll recognize that most of the time, their restrained by means that could not possibly restrain him if they used their force. We’re like that. Sometimes, an attempt at innovation in our job, in our office, in our workplace. It seems that the innovation we suggested is either a threat to other workers resisted by the inertia of the establishment, like the grown elephant, you may say, “I can’t do that. It never worked before, so it never will.” You give up without trying. The elephant is trapped by a belief, a relic of earlier experience that is no longer true. People tend to limit themselves by holding to old beliefs rather than testing themselves and changing them. And they’re chained in a self-imposed prison of limitation. It’s gonna be true of many workers. Make sure it’s not true of you. Keep alive the constant feeling of enthusiasm for your work. Keep in a constant state of self-competition, not competition with others. Not to be superior, rather, but to be superior to your former self. Progress is a part of growth. Someone once said to me, not knowing a slip of the tongue had been implied, “Every talk you give is a little better than the next one.” I have to think about that. Never sit down to a day’s work without challenging yourself to find ways to do it better. When was the last time you did that? Sometimes we make commitments in the first of year to get into action about a job or give us a raise in salary. Never sit down any day to work without challenging yourself to find new ways to do it better. I mean, it’s a conviction. And I say, “How can I have enthusiasm about this job? It’s the same old thing. How can I have a conviction about it when I’m not even sure that it’s doing the right thing, if it means anything?” It means something to you to pick up a paycheck, doesn’t it? You’re there by divine appointment as long as you keep the appointment. Otherwise, you’ll be disappointed and resign yourself to work in a state of gloom. If you have no conviction about your job, you better find something that you can have great conviction about or your life will be in turmoil. You’ll be working against yourself. Never become discouraged by setbacks or obstacles or difficulties, because many a person has accepted the belief that he should never have a defeat, twisted and hung up on this. Twisted he didn’t have any defeat, so if he has a defeat he feels guilty and he hides it. He doesn’t tell anyone about it. Even Jesus had defeats, but he was never defeated. Having the ability to cope doesn’t mean you’re not gonna have a failure. Edison had hundreds of failures before he developed the electric light bulb. No one in life can go along without making some mistakes or having fallen down, having failed. Funny thing is, to cope is to be undefeatable. You’re not defeated by a situation. Hit the feeling of divine appointment that will always have you in your right place with all experiences and things do happen as a fulfillment. Perhaps in consciousness, you’ve been disappointed, you’ve missed your appointment. But you can take charge of your life, take control of your thoughts and feelings about your employers, about the people that seem to let you down, about yourself as a person. The work is what you’re meant to do, it’s your divine appointment. Hit the realization that there’s no recession in your life no matter what the world says, you’re in the flow of prosperity. You can set the action anywhere, today, yesterday, a week ago. Come think of a specific instance when you felt hurt or disappointed on your job. An instance when you felt hurt or disappointed. Look back as far as you need to to pick up one that you can center in on and roll the film. Watch yourself in action there. See how this situation unfolds. Have a stress meter with a needle that goes up and registers feelings of hurt and disappointment. Sitting at your desk or your bench, into the workplace walks the boss. Comes towards you, but he turns and stops at the desk next to you, the other person. It’s an assignment that you’ve been hoping for, he gives it to the co-worker. See his face as it happened. Look at it, get the feeling of it, the boss, opportunity at his hands, giving it to another person. Be honest as you sense and see your reactions. How are you feeling? Be frank and honest with yourself, you feel hurt, upset, disturbed. Accept it as being an honest appraisal of where you are. When you’ve seen enough of this, rewind the film. Here we’re gonna do another exercise. We’re gonna do it again. This time, with a different ending. The situation’s the same, the characters haven’t changed, the work and the responsibilities are the same, but you’re different. You’re in control and in charge of yourself. Just as conscientious and committed. There’s no hurt or disappointment. You have the ability to cope. And the feeling of gratitude with the image, emblazoned upon my consciousness, and myself, dealing with a most difficult experience with love and unresistance, and an attitude of coping. Let’s just get a sense of gratitude now. Feel good about it, good about yourself, good about your work, good about life, good about the realization that there’s a divine appointment for you, as long as you keep in the flow there should be no missed appointment, no disappointment. Resolve now, to take this impact of this vision, this image, with you as you go. Bring this image with you at work tomorrow, or the next day, or the next. Remembering, no matter what happens you can cope. And you should know the truth and the truth shall make you free. So be it. Let’s take just a moment now to turn the process around. We’ve been receiving for an hour while I give. You’re our conscience, you’re our peace, you’re our love to all the world. Retaining the idea of the circle of light, we’re surrounded with this great circle. We’re a part of it. Our light is part of the continuity of stars that all goes forth from here into all the world. The conscience we’ve experienced, the love, the coping process. Let’s just see it going out to people everywhere. Let there be peace on earth and let it begin with me. Let’s rise and sing it together.